August Diehl (born 4 January 1976) is a German actor, primarily known to international audiences for playing SS-Sturmbannführer Dieter Hellstrom in Inglourious Basterds and Michael "Mike" Krause, Evelyn Salt's husband, in the movie Salt, as well as for his leading role in the Academy Award-winning Austrian film The Counterfeiters (2007). Diehl was born in Berlin. His father is actor Hans Diehl, his mother is a costume designer and his brother is a composer. His family was frequently moving around, while he grew up: the Diehls lived in Hamburg, Vienna, Düsseldorf, Bavaria and France. Growing up in a family of artists, at the age of 18, he played Franz Mohr in a school theatre production of Die Räuber by Friedrich Schiller. After passing the Abitur exams, Diehl studied acting at the renowned Hochschule für Schauspielkunst Ernst Busch in Berlin. In 2000, he was named one of European film's "Shooting Stars" by the European Film Promotion. In 2006, Gala magazine named him "the most important German actor of today." 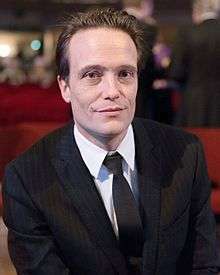 Diehl is married to actress Julia Malik. On 23 May 2009 the couple had a daughter, Elsa Augusta. Diehl plays the guitar and speaks Spanish, German, French and English. 2011: If Not Us, Who? ↑ "Bayerische Filmpreisträger" (PDF). Bavarian Film Awards. 22 March 2012. Archived from the original (PDF) on 8 June 2011. Wikimedia Commons has media related to August Diehl. "August Diehl - Porträt 500". cineastentreff.de (in German). Archived from the original on 7 July 2012.